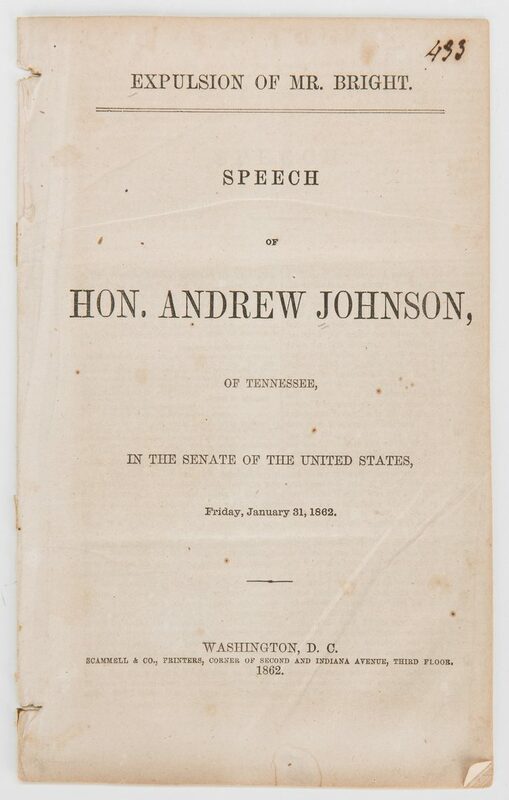 Six (6) 19th Century United States Senate publications, including President Andrew Jackson response to the Nullification Crisis of 1832-1833, President Andrew Johnson speech, and more. 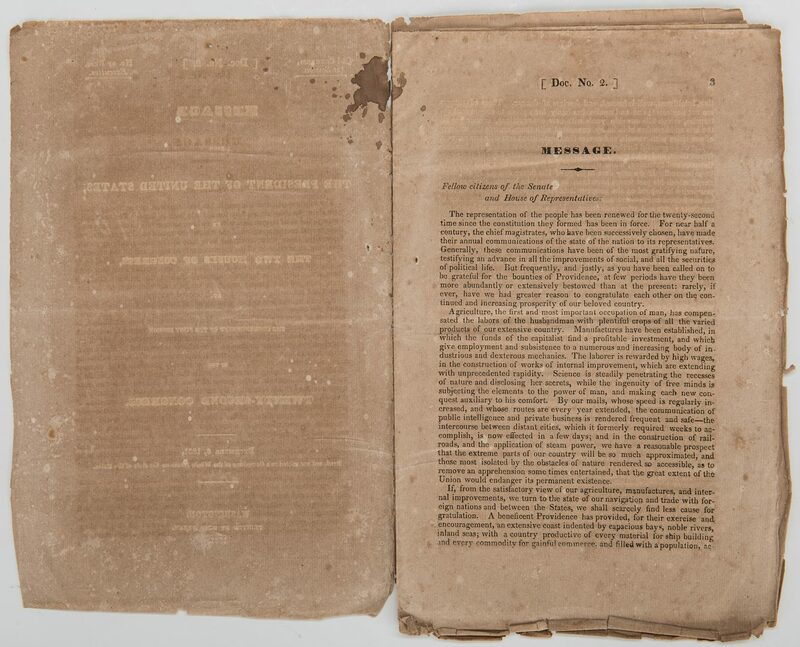 1st item: Message from the President [Andrew Jackson] of the United States, Transmitting Copies of the Proclamation and Proceedings in relation to South Carolina, January 16, 1833, 22nd Congress, 2nd Session. 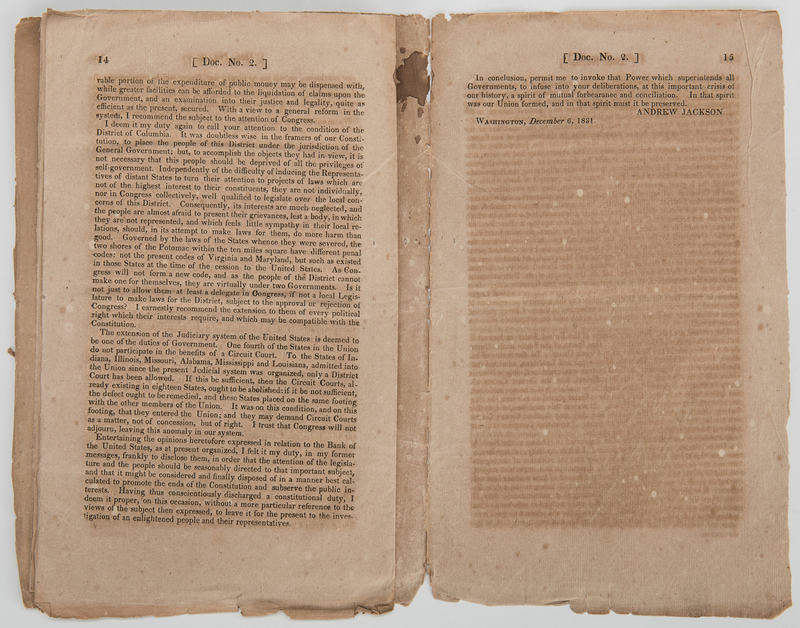 Paperback octavo booklet, 112 pages, stitched. 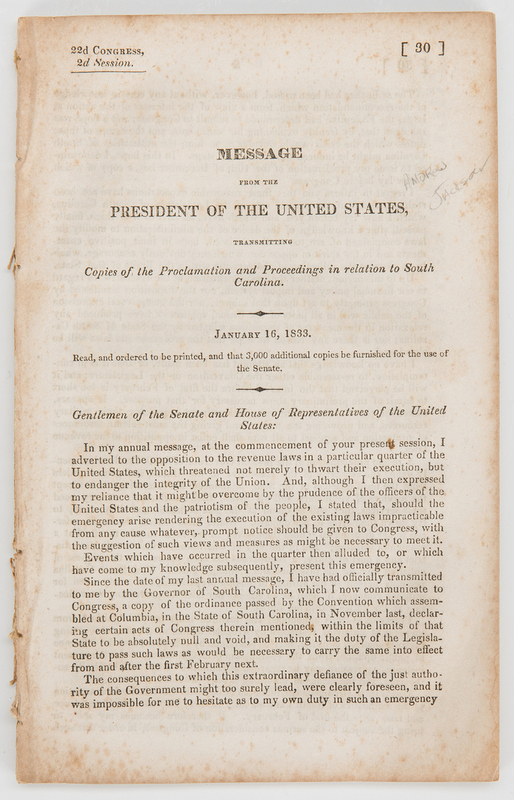 Address given by President Andrew Jackson in response to the Nullification Crisis of 1832-1833 which involved a confrontation between South Carolina and the federal government. 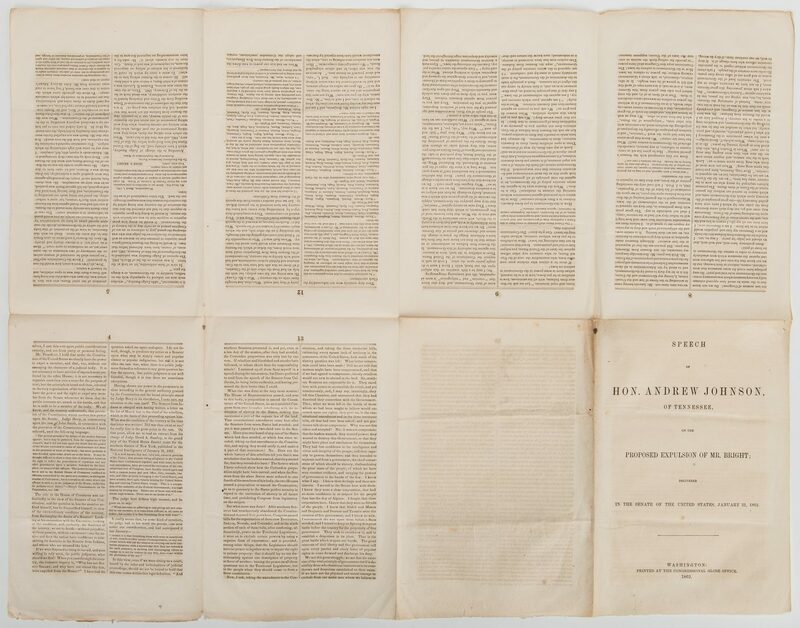 It ensued after South Carolina declared that the federal Tariffs of 1828 and 1832 were unconstitutional and therefore null and void within the sovereign boundaries of the state. This address introduced Jackson's Force Bill that stipulated the closure of custom houses in Beaufort and Georgetown to be replaced by ships located at each port. The custom house in Charleston would be moved to either Castle Pinckney or Fort Moultrie in Charleston harbor. Direct payment rather than bonds would be required, and federal jails would be established for violators that the state refused to arrest and all cases arising under the state's nullification act could be removed to the United States Circuit Court. 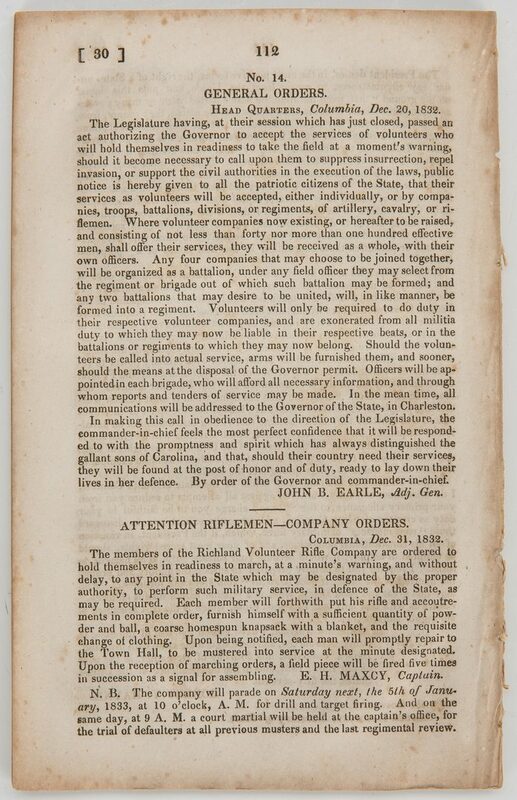 The militia acts of 1795 and 1807 would be revised to permit the enforcement of the custom laws by both the militia and the regular United States military. Jackson closed his address by stating "The rich inheritance bequeathed by our fathers has devolved upon us the sacred obligation of preserving it by the same virtues which conducted them through the eventful scenes of the Revolution and ultimately crowned their struggle with the noblest model of civil institutions. They bequeathed to us a Government of laws and a Federal Union founded upon the great principle of popular representation. After a successful experiment of forty-four years, at a moment when the Government and the Union are the objects of the hopes of the friends of civil liberty throughout the world, and in the midst of public and individual prosperity unexampled in history, we are called to decide whether these laws possess any force and that Union the means of self-preservation. The decision of this question by an enlightened and patriotic people can not be doubtful. For myself, fellow-citizens, devoutly relying upon that kind Providence which has hitherto watched over our destinies, and actuated by a profound reverence for those institutions I have so much cause to love, and for the American people, whose partiality honored me with their highest trust, I have determined to spare no effort to discharge the duty which in this conjuncture is devolved upon me. That a similar spirit will actuate the representatives of the American people is not to be questioned; and I fervently pray that the Great Ruler of Nations may so guide your deliberations and our joint measures as that they may prove salutary examples not only to the present but to future times, and solemnly proclaim that the Constitution and the laws are supreme and the Union indissoluble". 9" H x 5 3/4" W x 1/4" D. Note: The Nullification Crisis of 1832-1833 is considered to be one of the many events that lead to the secession of South Carolina from the Union, culminating in the Civil War. 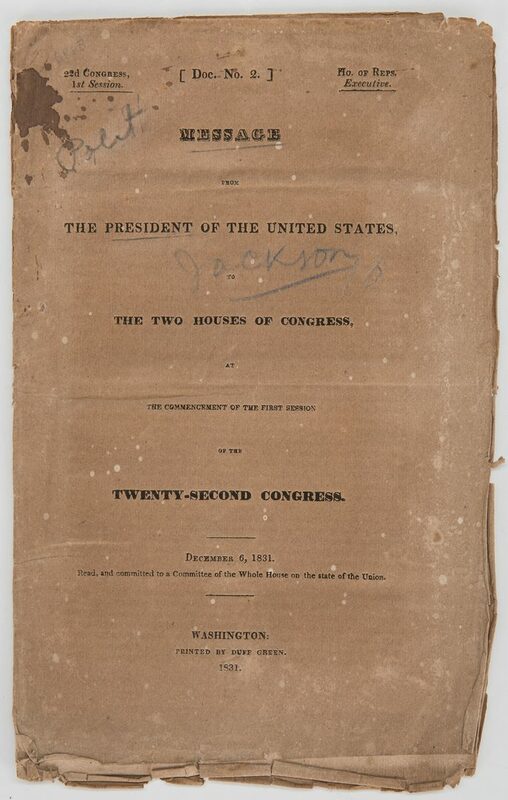 2nd item: Message from the President [Andrew Jackson] of the United States to the Two Houses of Congress, at The Commencement of the First Session of the Twenty-Second Congress, Document No. 2, December 6, 1931. 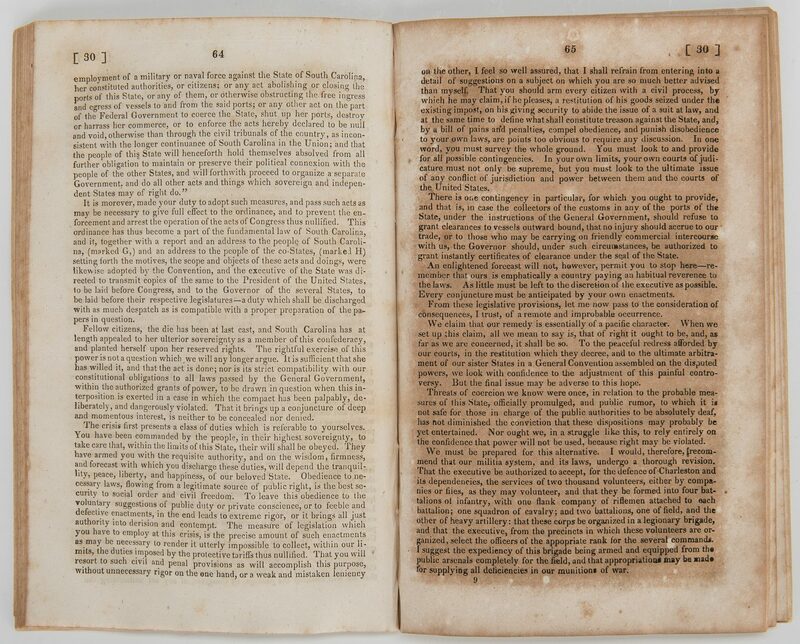 Printed by Duff Green, Washington, D.C, 1831. Paperback octavo pamphlet, 15 pages. 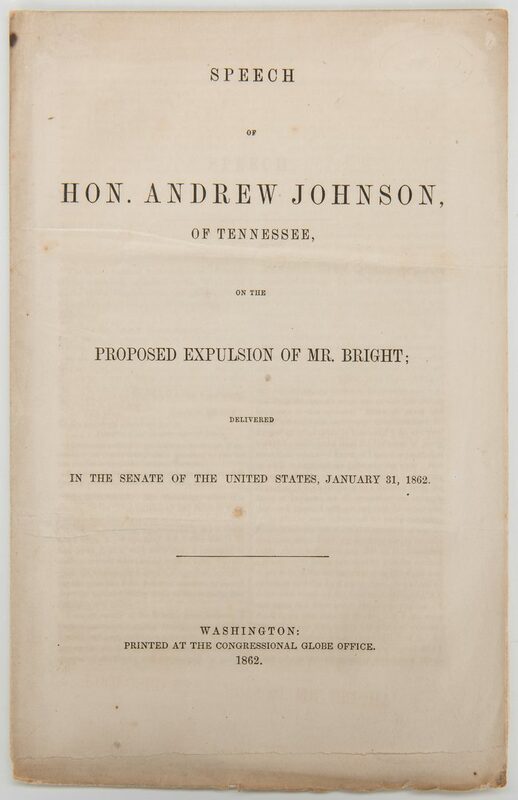 President Jackson devotes the majority of his remarks to foreign affairs, reviewing new events in Britain, France, and Spain and focusing especially on matters of trade. Jackson also recommends new consular laws to avoid defection, and he submits a report from the secretary of state to Congress. 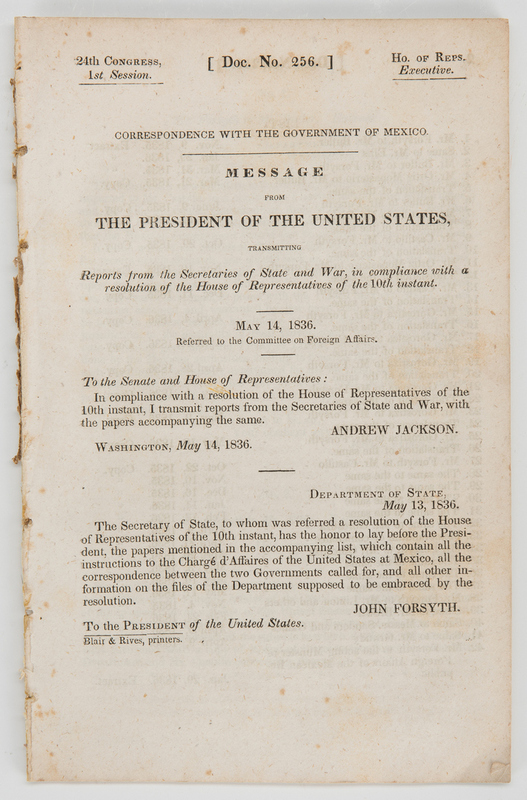 10 1/8" H x 6 3/8" W. 3rd item: Correspondence with the Government of Mexico, Message from the President [Andrew Jackson] of the United States, Transmitting Reports from the Secretaries of State of War, in Compliance with a Resolution of the House of Representatives of the 10th Instant, 24th Congress, 1st Session, Document No. 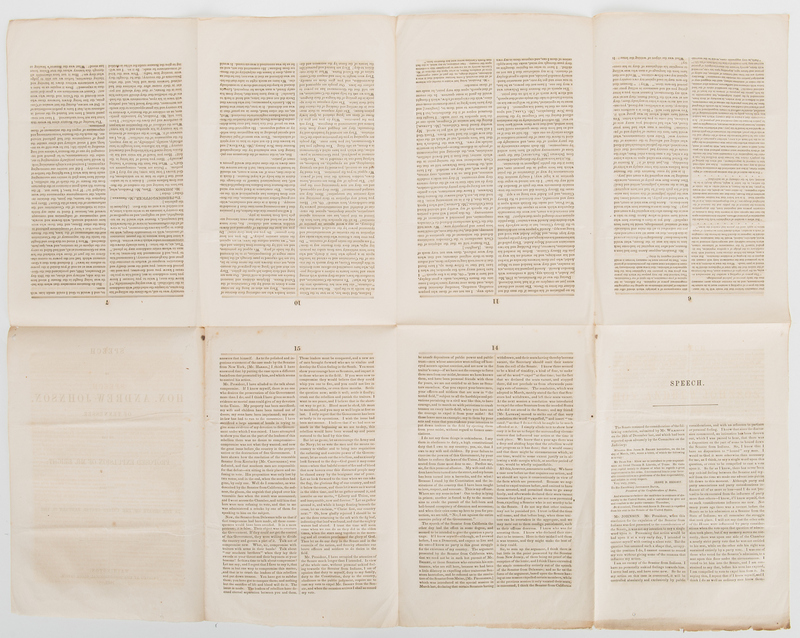 256, May 14, 1836. 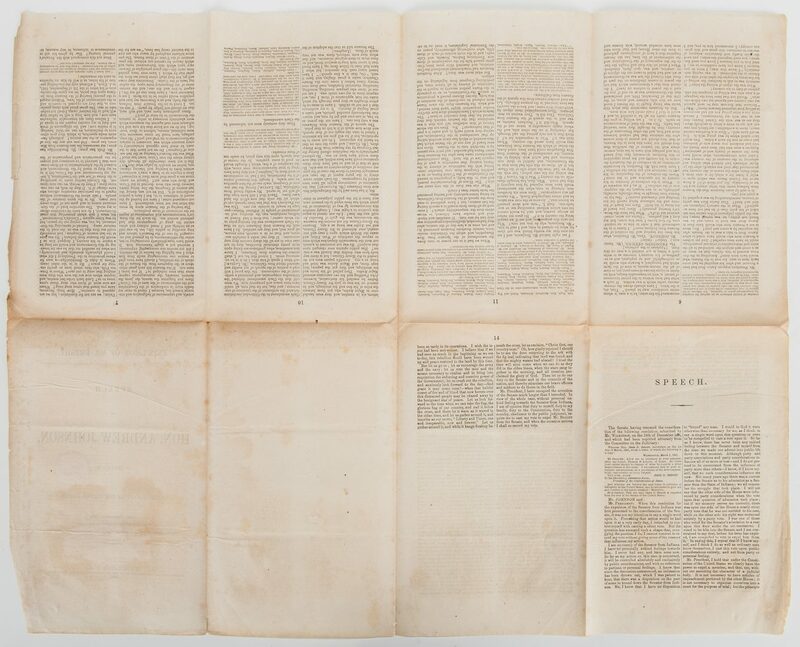 Printed by Blair and Rives, Washington, D.C., 1836. Paperback octavo booklet, 61 pages, stitched. 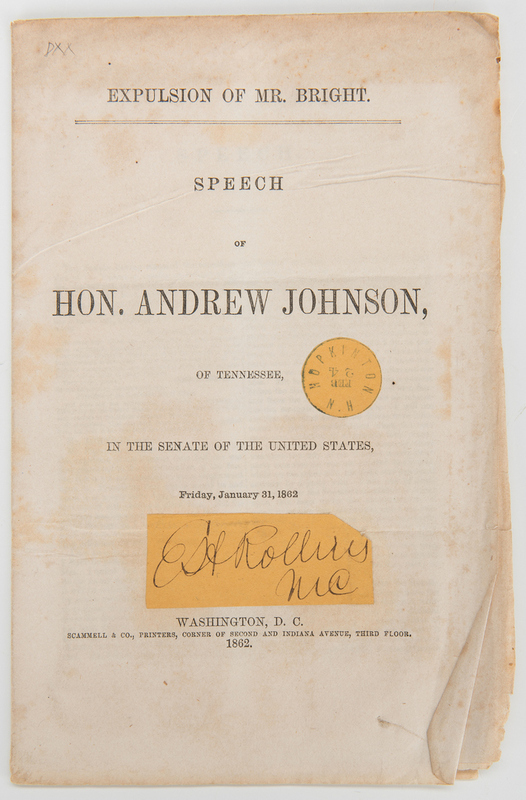 8 3/4" H x 5 5/8" W x 3/16" D. 4th-6th items: Three (3) Civil War era pamphlets containing speeches of Senator Andrew Johnson, of Tennessee, proposing the expulsion of Senator Jesse David Bright, of Indiana, in the Senate of the United States, Friday, January 31, 1862. 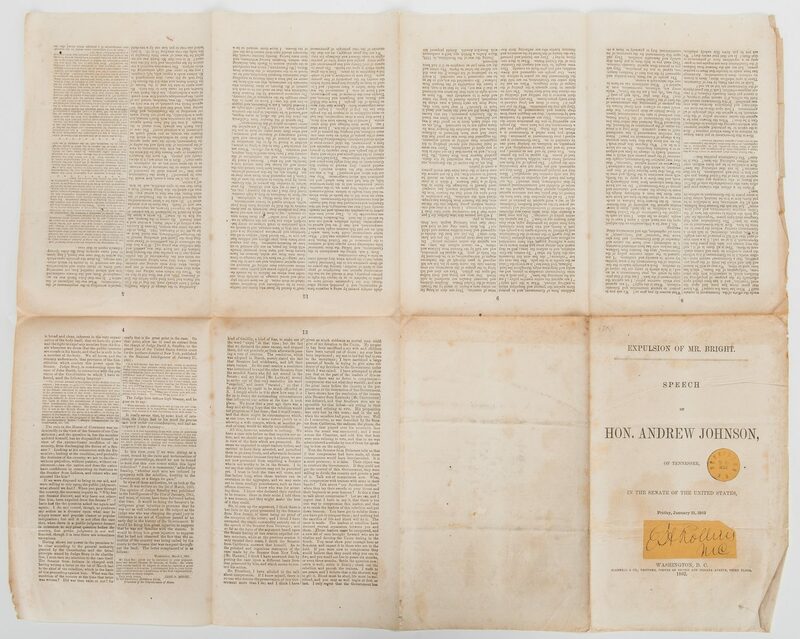 Printed by Scammell and Company and the Congressional Globe Office, Washington, D.C., 1862. 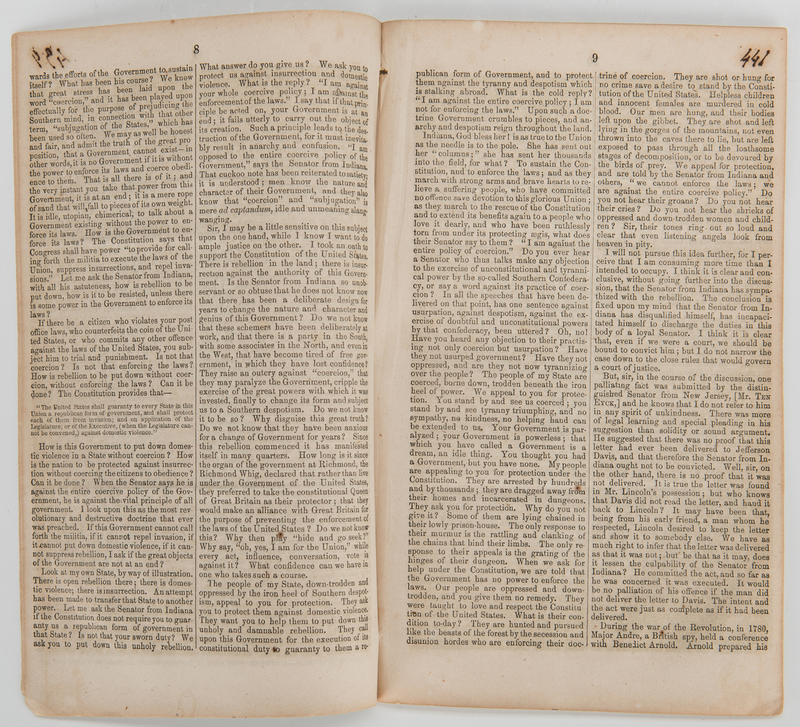 Paperback octavo pamphlets, 13-14 pages. One (1) pamphlet with a cut signature, possibly belonging to James S. Rollins, Member of the U.S. House of Representatives from Missouri's 2nd district, pasted to the front cover. 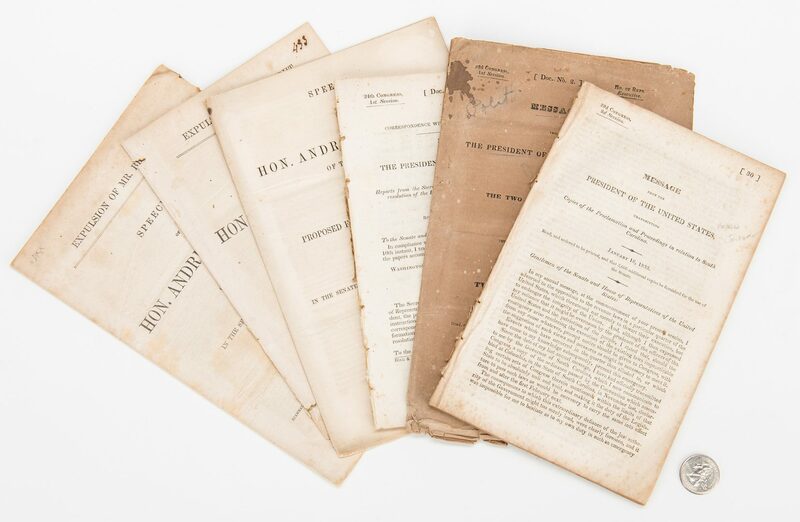 Pamphlets range in size from 9 1/8" H x 5 5/8" W to 9 3/4" H x 6 3/8" W. Note: In the beginning of 1862, the Senate of the 37th Congress, which was composed of twenty-nine Republicans and ten Democrats, voted to expel Bright for acknowledging Jefferson Davis as President of the Confederate States and for facilitating the sale of arms to the Confederacy. 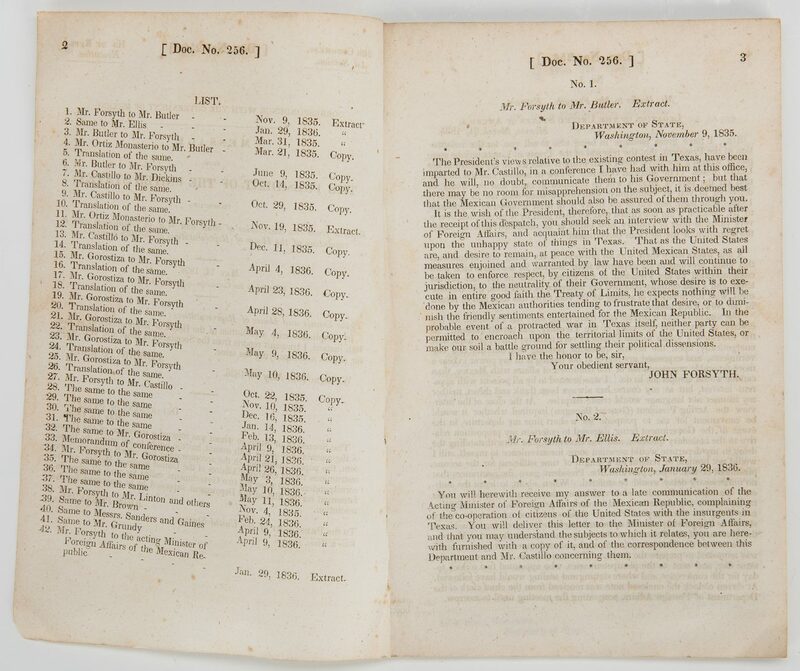 The issue was brought up when Minnesota Senator Morton S. Wilkinson introduced the Senate to a letter dated March 1, 1861, written to Davis and signed by Bright, involving firearm trades. The letter was found on a captured gun trader crossing the Confederate border during the First Battle of Bull Run. CONDITION: All items with foxing spots, toning, areas of acid burn, tears, etc. to be epected from age. Cut singature in good condition.